Parakeet Reviews is an ebook review blog that seeks to help out anyone who says, "I need a book recommendation." Having read and enjoyed Nightsongs: The Necropath Book 1, I got very excited when I learned about a new prequel novella to the series, featuring a character I love, Gothic. 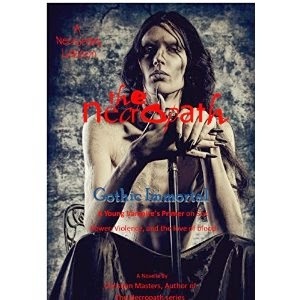 The novella is called, Gothic Immortal: The Necropath Book .666. It takes the reader on Gothic’s journey from being a young boxer interested in violence and vampires to a necros. The story begins near the turn of the 19th century, covering Gothic’s death, time in the necrosphere, and return. As someone who was fascinated by Gothic in Nightsongs, I loved getting to learn about his origins in this book. You really get to see a different side of Gothic as he learns about the necrosphere. Much of Gothic’s knowledge of the necrosphere and abilities of those in it comes from interesting, almost philosophical conversations with his brother, Frederick, and the enigmatic, sage-like Bourne. The dialogue is extremely engaging and really shows the curious, inquisitive side of Gothic that you might not associate with someone with such a strong thirst for blood. You definitely don’t need to read this prequel for the Necrosphere series to make sense, but it gives the reader a lot more insight into Gothic’s character and motivation. Recommended for anyone who is a fan of the series and even more so if you're a Gothic fan! Get emailed the newest ebook reviews! Parakeet Reviews is an ebook review blog that wants to introduce people to their new favorite books. Although every once in awhile we'll review a print book, 99% of the books we review are ebooks. It's our hope that we can provide you the best book recommendations available on the web, regardless of your preference in genre. If you want to learn more about us, check out our about us page. For those who want to contact us, you can find out how on our contact page. Keep reading! Give credit to Parakeet Reviews whenever quoting from this free book review blog. Simple theme. Theme images by luoman. Powered by Blogger.